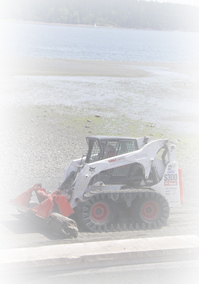 Welcome to Graf Excavating, a Vancouver Island based Excavating Contractor! Graf Excavating Company began in 1985, and was structured around industrial type work; primarily working on the west coast of Vancouver Island, in and out of pulp and saw mills. In 1990 our company began to adapt into hydro and telephone installations. With a small group of talented trades people, capable of using their skills in diverse applications; Graf Excavating has completed a wide spectrum of work. This includes, but is not limited to, anything from seawall restoration work, road wash out repair, residential housing, architectural designed rock work, pulp mill deficiency work, concrete demolition, confined space excavations, onsite sewage systems, site development, and hydro telephone duct installation. We also have a specialized piece of equipment available, a Slinger truck, which will deliver material quickly, efficiently and most importantly with little mess or extra work. Check out our video within the Slinger Truck link on the side menu. The company has completed jobs up and down Vancouver Island and as far as the Yukon Territory and Alberta. The company is fully insured, bonded and is proud to have an extremely high safety record, BCCSA (COR) accredited, with a working occupational safety program in place. Our business philosophy is customer satisfaction built on safety, cost effectiveness, quality installations and a diverse use of specialized equipment and people. We provide our services to all areas of Vancouver Island, British Columbia, Yukon Territory and Alberta. Our closest service areas of service are; Cassidy, Cedar, Nanaimo, Parksville, Qualicum, Ladysmith, Chemainus, Duncan, Cowichan and Victoria.